Want to connect an entire RV's worth of gadets to WiFi, but don't have good reception? This kit will get you connected! Sets up in minutes! Our USB Wifi Router Repeater, fondly known as the WiJacker, is a handy device. When you connect the blazingly powerful, 2,000mw Wave Plus paired up with the 8dbi WiMag antenna to the repeater, you have one of the best wifi-sharing solutions on the market! The USB Router Repeater and Wave Plus are made from durable CNC aluminum. It's nearly bulletproof!. The Wave Plus and WiMag antenna allow you to connect from far away. With this kit, you can connect all your devices to a far-off WiFi network using a high-powered antenna. RadioLabs has taken their equipment to the next level. The 8dbi WiMag antenna has a magnetic base, and can attach easily to the top of your RV, car, or boat. It is powered by the 2,000mw Wave Plus and together, these two can draw in signals you would not otherwise be able to reach. Paired with the USB Wifi Router Repeater, you can share that connection with all your devices such as tables, smart phones, and computers. Interested in maximizing the performance of our USB WiFi Router Repeater? This is the kit you need. The Wave Plus, coupled with the WiMag8, allow you to enjoy a localized WiFi network for connecting all your devices to a far-off hotspot. After logging into the Repeater, locate and connect to the desired public or private WiFi signal (if the network is private, you will need to enter the passphrase). Change the SSID of your new personal Access Point ex: "Will's House"
This USB Router Repeater kit is designed to connect you to far-off wifi signals. 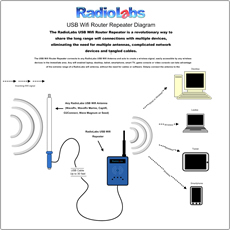 The Repeater broadcasts a wifi network your tablets, smart phones, and basically any wireless device can connect and surf without needing a powerful external antenna for each device. All it takes to setup the USB Router Repeater is a computer with most any standard web browser (Safari does not work, but Firefox or Chrome on a Mac works fine). The configuration tool is easy to use--easier than most commercial routers--and within seconds you can configure your Repeater hook up to a new access point and begin broadcasting your private network..
WavePlus Adapter: 2 Watts (33dBm). Wave Plus: 3.25" x 2.25" x .5"